INTRODUCTION: Despite data suggesting improved outcomes with laparoscopic colectomy (LC), less than 10% of colectomies in the USA are currently performed laparoscopically . One mechanism of incorporating LC into practice is to attend a LC Course (LCC). Post-course mentorship is recommended by SAGES and the ASCRS, in addition to course participation, to encourage adoption of the new techniques. As the use of LC will likely increase, access to mentorship is an important consideration for LCC participants. We sought to evaluate mentorship access and related factors for participants in an ongoing LCC. METHODS: Participants in 6 consecutive single center LCCs were anonymously surveyed regarding age, specialty, surgical experience, practice, and mentorship availability. Contingency and regression analyses were performed. RESULTS: 84 participants were surveyed; 70 (85%) were male, and 47 (56%) were general surgeons. Detailed information is provided in Table 1. Of the 64 participants surveyed about mentorship, 60% (40) had access to a mentor. 58 (69%) performed ≤1 advanced laparoscopic case monthly at the time of participation. Factors associated with access to a mentor on univariate analysis included age (OR=0.40, 95% CI [0.04-0.44], p=0.001), level of training (OR=0.54, 95% CI [0.3, 0.96], p=0.041), and being a general surgeon (OR=0.32, 95% CI [0.11, 0.92], p=0.034). 26% (12/46) of younger surgeons (<47 years of age) did not have access to a mentor, as compared with 71% (15/21) of surgeons ≥47 years old. Older surgeons consistently had less access to mentorship in multivariate analysis (OR=0.12, 95% CI [0.025, 0.578], p=0.008). 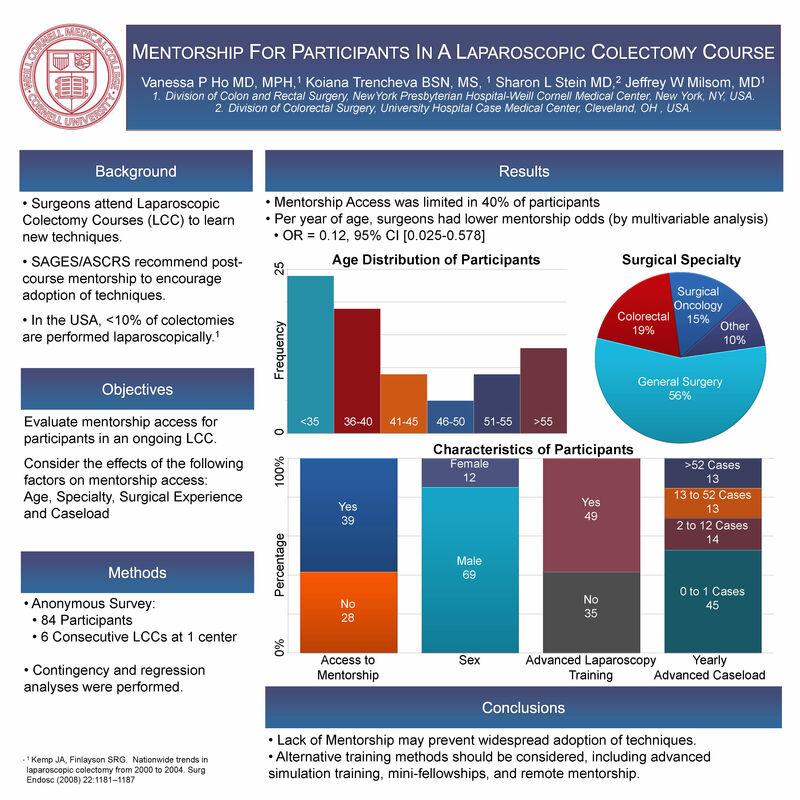 CONCLUSIONS: A significant number (40%) of surgeons participating in LCC have limited access to mentors. In particular, older surgeons have the least access to mentorship. Further study is needed to see if lack of mentorship is a hurdle for surgeons incorporating these techniques into practice. In order to encourage adoption of LC, training methods should be adopted which accommodate surgeons without access to mentors. Possible strategies include longer or multi-session courses, simulator training, and remote mentoring.